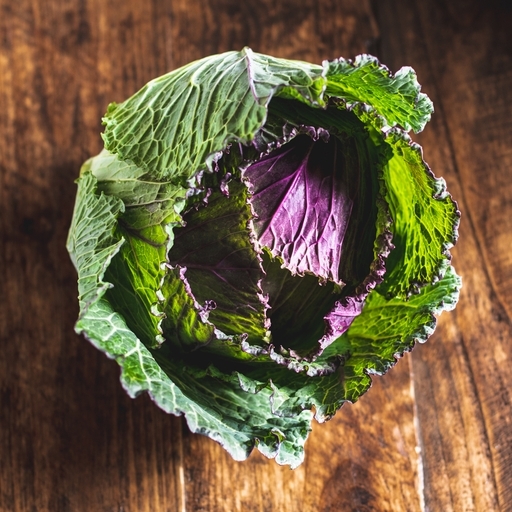 The January King is our favourite winter cabbage (along with Savoy!). They are great in the kitchen, but hard to manage in the field; from the same sowing date, they can mature any time between October and February. Whenever they arrive, their beautiful purple-tinged leaves are stunning in the field on your plate. Sweet, delicate and tender. Cabbage is a versatile veg. Shredded and used in stir-fries, curries, soups and stews, it adds a healthy bulk of greens. Simply steamed or braised and buttered, it’s a good foil for meat dishes. Make it the star of the show in a gratin, or use larger cooked leaves as wrappers for rice, grains and veg, or for mince. Delicate January King cabbage will take just 3-5 mins to steam, or simply cook for about 10 mins over a medium heat with a good dose of butter. In season from October to February. We grow cabbages on all our Riverford farms. They're a really underrated British brassica and thrive in our climate.